I absolutely adore wooden puzzles, and wire puzzles, string puzzles, twisty puzzles, plastic puzzles...OMG! 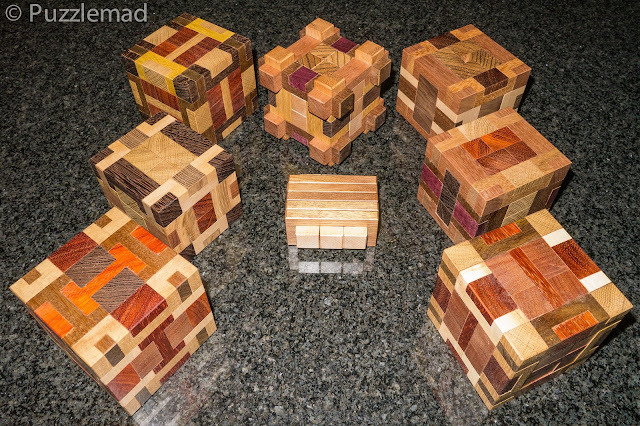 A few weeks ago I showed off/reviewed a couple of the interlocking cube designs from my friend Alfons Eyckmans and was astounded to see that he followed up very quickly with a few more designs. They looked stunning and were named after family members of other puzzlers. I don't have any children but I do have cats. I couldn't resist when Alfons offered me the opportunity to name some of the new designs. I named them Zachary and Zebedee after my current 2 Burmese boys and then another was named Zanzibar after the one who died a few years ago...there's definitely a trend there. I cannot wait to have a play with these. Thank you Alfons for the puzzles and being able to name some.